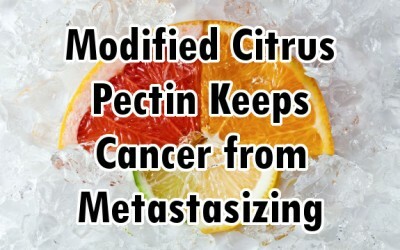 While modified citrus pectin (MCP) cannot treat cancer once it begins, this natural substance that occurs in the pulp of citrus fruits, especially grapefruit, can keep cancer from metastasizing (spreading). MCP is a preventative medicine for cancer, not a curative one, but it has been proven to be very effective. Modified citrus pectin should not be confused with the pectin that is sometimes used for cooking. MCP is in all citrus, but occurs in higher amounts in grapefruit. The active ingredients of MCP have been shown to suppress angiogenesis, the process by which cancer cells survive by obtaining blood through the blood vessels that each cell grows. Without a steady flow of blood, the cancer cell cannot survive, and apoptosis occurs. In individuals with advanced cancer, MCP will not be effective, but as a preventative measure the substance can prohibit cancer cells from forming at all. Cancer cells must also spread in order to debilitate a person with illness or death, so MCP works effectively in this manner as well. The same way that you would die without sufficient nourishment, so do the cancer cells. Studies confirming MCP’s efficacy in preventing the spread of cancerous cells can be found in the American Journal of Pharmacology and Toxicology. Furthermore, MCP molecules bind to receptors of cancerous cells very efficiently, prohibiting them from binding to nearby, healthy cells. Since the diseased cells cannot bind with the healthy ones, they have no choice but to be circulated back through the blood stream and then eliminated through the liver, kidneys, bowels, and other forms of detoxification utilized by the body. All disease can be mitigated by keeping the immune system strong and healthy, and since MCP allows the auto-immune function or disease-fighting energy of the body to be directed at other tasks, it is not exhausted by having to eliminate cancerous cells that never have a chance to form. 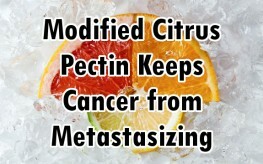 The cancer cell load is therefore always kept low by eating more fruits with pectin, and especially grapefruit. In this way, an individual can remain cancer free.